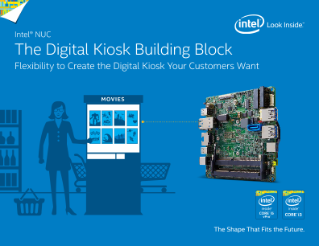 There's no better building block for creating digital kiosks than the Intel® NUC board. With support for touch panel screens and Intel® HD Graphics for vibrant HD video playback, the Intel® NUC board lets you create digital kiosks that deliver the user experience your customers expect. With features you need for remote installations, including the Intel® Core™ ...vPro™ processor, a slot for M.2 SSDs, the ability to configure RAID, and a watchdog timer, you can build a digital kiosk that runs securely and reliably.